Since the radish can be found in most kitchens and family gardens, we assume we know all about it. 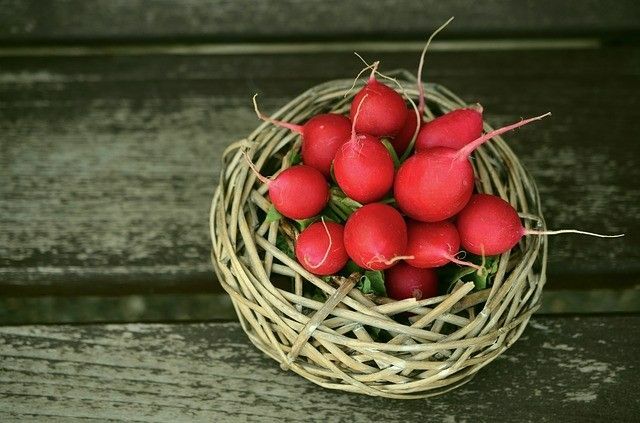 But, did you know that the radish was one of the first vegetables to be cultivated in Asia, more than 5,000 years ago? Part of the cruciferous family, like broccoli, its significant role in the prevention of certain cancers and cardiovascular diseases is now being acknowledged. Usually, only its root is eaten, but its leaves or tops are equally edible: the adult leaves are a little bitter, but the more tender ones can be found in mixed greens (sold in most grocery stores). In salads, radishes are almost always eaten raw. However, they taste delicious when cooked, because then, the piquant taste becomes milder and is reminiscent of small turnips. I recommend that you try out radish in two new ways: boiled, as a side dish, as in our recipe for Radishes with Chives, and also in a sauce for pasta, like Farfalle (Bow Tie Pasta) with Radishes.